If you've ever gone camping for an extended period, then you know how valuable campsite radios can be. They can transform a quiet and boring campsite into one filled with fun and laughter. In this article, you'll learn what options are available and what the differences are between them. These days, radios are really a dime a dozen. There are cheap ones, pricey ones, high-tech ones and even some that are like a Swiss army knife for camping - including everything from an emergency strobe light to a storage area for matches and emergency supplies. There's no lack of options when it comes to campsite radios, so how do you know what to buy? The choice comes down to what activities you'll be doing while you're camping, and how light you need to travel. 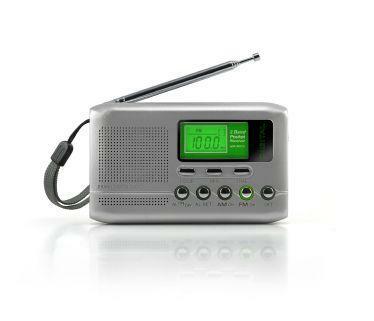 The most common type of radio, and the easiest to find in any store, is the battery powered campsite radio. These are also the least desirable radios, because a battery power source in the wilderness is not very reliable. Not only do batteries have a limited life, but they can also easily become unusable if they get wet. However, in non-emergency situations, battery powered radios usually provide the most features. For example, in this category you'll find any combination of the following features. Most battery powered radios also come with an AC/DC adapter that you can plug into a car cigarette lighter or an outlet to recharge the batteries. It is possible to find other types of campsite radios that are not powered by batteries and have some of the same features, but most of the time you'll be trading luxury and features when you choose radios with alternative power sources. With that said, there are many very important advantages to radios that use alternative power. Those advantages are detailed below. Solar powered radios are simple and efficient. They usually still use an internal rechargeable battery to store electrical charge built up from the solar radiation during the daytime, but for the most part, those batteries last for a very long time. The way solar radios work is during the day, sunlight strikes the solar panel on the radio. The solar cells convert that sunlight to electricity, which charges the batteries. Since radios typically don't use very much power to operate, the rechargeable batteries stay charged for a very long time. As long as the radio is occasionally placed in the sunlight to recharge the batteries, you'll never have to worry about the radio not working. With that said, since power consumption needs to be low, solar radios usually have few or no additional features such as a flashlight or digital clock. The ones that do tend to drain down the battery much faster. The advantages to solar powered campsite radios is the fact that no matter where you are, and no matter how long you're there, you never have to worry about your radio running out of power. You won't need to find a car charger or an outlet anywhere to recharge the batteries, because the solar panel keeps the batteries constantly charged for you. Crank radios are a favorite among backpacking enthusiasts. This is because they are usually very small and very light. Like solar powered radios, they usually have an internal rechargeable battery. The radio is recharged by turning a mechanical crank. This crank spins a small magnet through copper wires, which generates the electricity that recharges the battery. These radios are perfect for emergencies because they are dependable, very simple to use, and as long as you can turn a crank you'll always have access to news, weather information and of course all of the music you could ask for. Now that you know the differences between these portable radios, you're probably ready to start shopping. The following are a few of the best online sources for these units. NextTag is always a good place to start, and there you'll find dozens of portable radios of all different types. Sangean produces portable radios, and offers an amazing waterproof "utility" radio. You never have to worry about the batteries getting wet! Sun Star International provides solar and crank radios that will work anytime and anywhere. When you bring along a radio on your camping trip, you can rest assured that not only will you have access to important weather and news information, but you'll also have a constant connection to your favorite music while you're sitting by the campfire with your family.